Probably a lot of you recognize this painting -- but maybe you don't know its identity. It's Whistlejacket, a famous horse honored in this painting by George Stubbs. "Stella McCartney was inspired to create Lucky Spot following a visit to Belsay. Her response to this beautiful place with its grand medieval castle and mystical quarry garden was to create something magical, romantic and visually stunning. 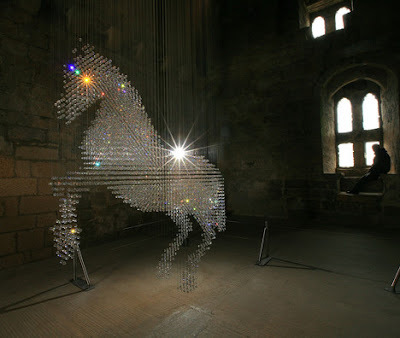 She designed a jewelled curtain of thousands of Swarovski crystals that hung in the shape of a horse from the ceiling in the Castle's Great Hall." And here it is. I could not decide which photo I liked best, so I'm including both. This one (left) gives you the sense of the dazzling crystals. And this one gives the sense of the suspension and precision of the design. And finally, below is a video of school children discovering the sculpture. As a child, I know how fun and memorable this experience would have been for me. I hope these children treasure that day! heh. .I dont know about that chandelier. I adore that painting. It has some resemblance to your baby doesnt it? especially when he was a weanling. of all things Wikipedia has the high-res version of the painting. How pretty! 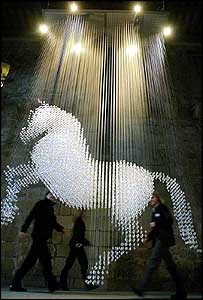 Then again, if you already have a castle, what else would it need besides a crystal horse? I bet it looks even better in real life. The lights just make it sparkle so. That first photograph is just brilliant -- I love how they've suggested a bright eye for the horse by capturing the glint just so. I'm not quite sure if I like the chandelier, but I've always loved that painting and Stubbs' work. It's gawjus; bright shiny objects AND horses! WOW! First to come up with the idea, THEN to execute it. I'd love to see it in person. That piece is so awesome! Thanks so much for sharing! I am sure it is breath taking in person. Absolutely beautiful! When are you going to do a contest to give one of those away? The children were so cute. Finding the horseshoes, then the crystal horse.